Brown syndrome secondary to sinusitis is rare, with only a few cases described in the literature. Saunders et al.3 described two cases of acquired Brown syndrome associated with pansinusitis in children. Both patients presented with severe pain and diplopia, with large angle hypotropia. Imaging findings were consistent with sinusitis. They were treated for sinusitis with oral antibiotics. One resolved with antibiotics, whereas the other improved with the addition of oral steroids. A more recent case by Sturm et al.4 reported acute bilateral elevation deficiency in a 19-year-old woman. Imaging was consistent with sinusitis, and she was treated with intravenous antibiotics. Her motility partially improved, but hypotropia recurred with another sinus infection. We describe a case of sinusitis-associated acquired Brown syndrome that was refractory to antibiotics and oral steroids, ultimately requiring surgical intervention. 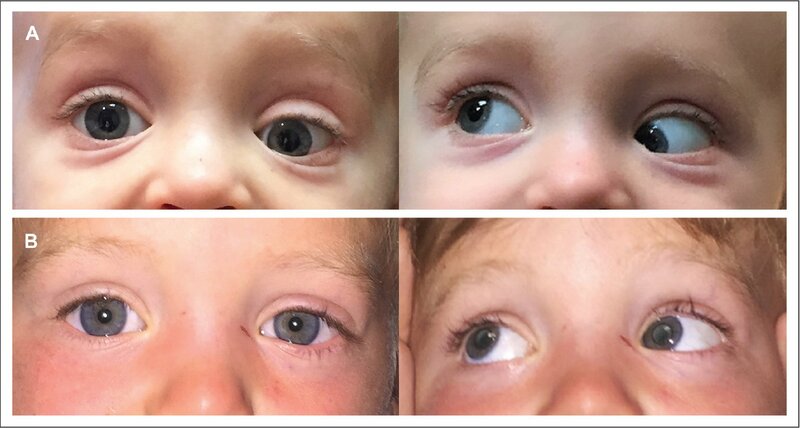 A 2-year-old boy was referred to the University of Wisconsin-Madison for sudden onset of strabismus that developed during a sinus infection. His parents observed that his left eye did not elevate and he had a new chin-up posture. He also complained of left eye pain. His sinusitis improved briefly after 3 weeks of oral amoxicillin-clavulanate, but recurred after only a few days. The hypotropia remained unchanged. No visible periorbital edema or erythema accompanied the infection, and sinus magnetic resonance imaging (MRI) from the referring hospital was negative for ethmoidal mucocele or abscess involving the superior oblique tendon. The patient's medical history was insignificant, and he had no history of trauma or autoimmune or inflammatory conditions. On examination, his vision was central, steady, and maintained in the right eye and central, steady, and unmaintained in the left eye. He demonstrated a 15 degree chin-up position and 10 degree left head tilt at distance and near. Cover testing revealed a 20-prism diopter left hypotropia at distance and an intermittent 15-prism diopter left hypotropia at near (Figure 1A). He had no swelling or erythema at the trochlear area. The remainder of his dilated eye examination was normal. Left superior oblique enhancement with good visualization of the trochlea and adjacent ethmoid thickening were apparent in his orbital and sinus MRI (Figure 2A). Superior oblique enhancement and significant maxillary sinus thickening were also well visualized on coronal view (Figure 2B). (A) The patient presented with a significant left eye hypotropia and elevation deficiency on adduction. (B) Excellent improvement in alignment was achieved with left superior oblique tendon lengthening, shown here 1 week after surgery. (A) Magnetic resonance imaging with water excitation reveals enhancement of the left superior oblique tendon (arrow) with good visualization of the trochlea on axial view. (B) Left superior oblique enhancement (arrow) and left maxillary sinus thickening is seen on coronal view. The patient was diagnosed as having acquired Brown syndrome secondary to a sinus infection. Outcomes ranging from spontaneous resolution to a possible need for strabismus surgery were discussed with his parents. Because he had an upcoming ear, nose, and throat evaluation and was starting a new oral antibiotic regimen, observation with a 1-month follow-up was scheduled. At his follow-up visit, he had worsening of his motility. Constant large-angle left hypotropia with poor fixation of his left eye were observed, which was concerning for amblyopia. He was prescribed oral prednisolone 1 mg/kg (10 mg) daily for 5 days, but could not comply with prescribed patching for amblyopia. Trochlear steroid injection and strabismus surgery were discussed. Because his Brown syndrome did not improve with oral steroids and extended courses of multiple antibiotics, surgical repair was elected. Intraoperative forced duction testing revealed severe (4+) superior oblique tendon restriction in the left eye with no restriction in the right eye. Left superior oblique split tendon lengthening was performed. The tendon was isolated and split 9 mm, then cut in a Z-shape, with the two split halves reattached with a 6-0 polyester suture. Intraoperatively, repeated forced ductions after surgery revealed no restriction of the superior oblique muscle. The patient showed excellent alignment postoperatively. At 1 week, vision was central, steady, and maintained in each eye. He was orthotropic at distance and near. In addition, his left eye elevation on adduction had improved significantly (Figure 1B), although he had a mild residual limitation. His chin-up posture had resolved. At 9 months, visual acuity was 20/25 in each eye by Allen pictures. He was orthotropic at distance and near, right and left gaze, and up and down gaze. Tertiary gaze positions could not be measured due to his lack of cooperation. His motility was stable. Computed tomography and MRI can be helpful for evaluating patients with acquired Brown syndrome.7 For young patients, MRI is favored over computed tomography to avoid radiation exposure. MRI features include tendon thickening on T1-weighted imaging, abnormal high signal intensity on T2-weighted fat suppression, and abnormal enhancement on T1-weighted gadolinium-enhanced imaging.8 Our patient's MRI findings were consistent with acquired Brown syndrome secondary to sinusitis. For patients with acquired Brown syndrome, observation is appropriate for initial management. Sinusitis is a rare but treatable cause of acquired Brown syndrome. Antibiotics and oral steroids may not be sufficient to resolve the secondary strabismus. Superior oblique tendon lengthening surgery should be considered if an affected child fails to improve with medical management and develops amblyopia. From the School of Medicine and Public Health (KML) and the Department of Ophthalmology and Visual Sciences (YB), University of Wisconsin-Madison, Madison, Wisconsin. Supported in part by an unrestricted grant from Research to Prevent Blindness, Inc. to the Department of Ophthalmology and Visual Sciences, University of Wisconsin-Madison. The authors thank the Department of Ophthalmology and Visual Sciences, University of Wisconsin-Madison.